Milestones are always fun to celebrate, and that is exactly what English Rock band Def Leppard is doing for the 35th anniversary of one of their best selling albums, High ‘N’ Dry. Released on July 11, 1981, it charted at #38 on the United States Billboard 200 and at #26 on the United Kingdom Albums Chart, eventually reaching double platinum status. 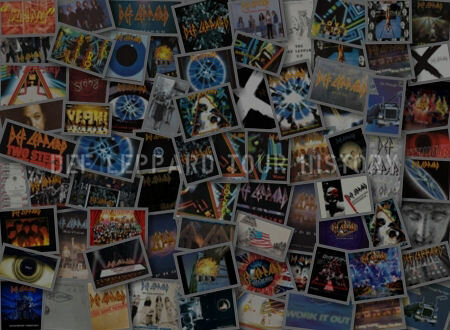 The album’s success laid the foundation for many other chart-topping releases as the band attained their greatest commercial success all through the 1980s well into the early 1990s. Through it all, they have been through several trials and tribulations but have persevered, and even excelled, overcoming any obstacle that came their way. So it comes as no surprise that these Rock-n-Roll warriors are going strong nearly four decades later as they spend the summer of 2016 touring North America with REO Speedwagon and special guest Tesla. 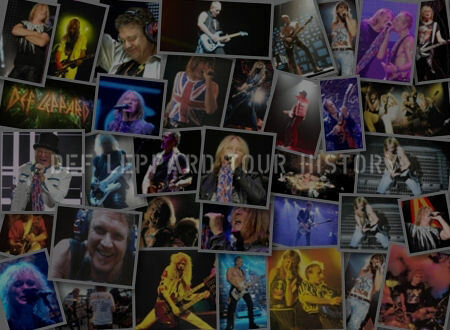 A tour that began back in May, it runs well into October with stops coast to coast, and the beautiful evening of Monday, July 11th, the actual anniversary date of High ‘N’ Dry, Def Leppard made their way to the Nikon at Jones Beach Theater in Wantagh, New York. 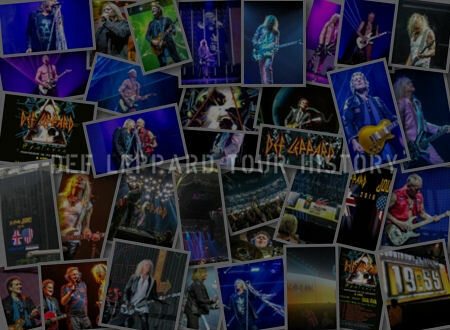 A venue they have a lasting relationship with, Def Leppard seems to make it a regular destination each summer tour. An experience Long Island Rock fans look forward, many were adorned in their concert t-shirts from Def Leppard’s past tours, and being this show was just a little more special, they were ready to celebrate well into the night. The relaxing breeze coming off the bay behind the venue continued to flow as the sun was now almost set with an awesome hue of oranges, pinks and purples filling the sky above. Taking the downtime to refill their drinks, everyone promptly returned to their seats with time to spare for headliners Def Leppard. Creating some curiosity, a large banner hid the stage with the band’s logo on it, as the anticipation grew even stronger. 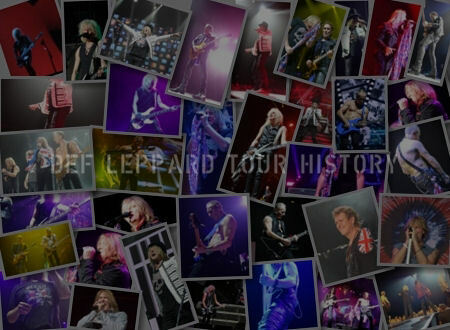 Then, in the flash of a moment, stage lights glowed as the banner was dropped down as Joe Elliott (vocals), Phil Collen (guitar/vocals), Vivian Campbell (guitars/vocals), Rick Savage (bass/vocals), and Rick Allen (drums/vocals) rushed out, provoking everyone to immediately rise from their seats. Taking everyone back in time again, crowd-favorite, 1983’s “Foolin’,” saw Collen take the spotlight during his blistering guitar solo. Keeping the hits coming, “Love Bites” gave fans a treat with Campbell taking center stage for a solo of his own. Both well-accomplished guitarists, the two of them both showed why they deserve back to back showcases. Then “Armageddon It” had the guys rocking and the girls shaking all they had as they danced at their seats. A brief breather from the music, Elliot went on to thank everyone and asked how they were, which was met with a nearly deafening response. Happy to see everyone was doing just fine, Elliot went on to speak about how the band was influenced by the music of the late 1970s as they went into David Essex song “Rock On;” a modern signature in the band’s set since they released a cover of it on 2006’s Yeah!. Keeping the music fresh, they did another new track, “Man Enough,” before quickly bringing the audience back to the 1980s with “Rocket” and “Bringin’ on the Heartbreak.” During “Switch 625,” Allen dazzled the crowd with his fancy footwork on the drums as he sweat, showing dedication. Performing another crowd pleaser, they offered “Hysteria” before Elliott asked, “Do you wanna rock?” to which audience yelled “Yea!” leading into “Let’s Get Rocked.” Wrapping up 2016’s visit to Long Island, Pop-favorite “Pour Some Sugar On Me” had all singing and on their feet prior to the band’s exit. A brief departure, they soon returned to screaming and adoring fans to play their two-song encore, smash hits “Rock of Ages” and “Photograph” before graciously praising the audience for their support. If one thing is certain, it is that this combination of three bands brings fun, high energy, and a list of hits that would be difficult to top. Each act clearly gave the fans their all with stellar performances, and with so many shows still to come, be sure to catch at least one before this Arena Rock dream dissipates.